I have a new app on the app store! It’s called SensaView, you can get it here. SensaView shows you the output from the various sensors on your iOS device. It will report location (lat, long, altitude), vector (course, speed, heading), accuracy estimates, accelerometer, gyroscope, and magnetometer. It’s not super exciting but it’s laying the groundwork for a new paid app I’m working on. 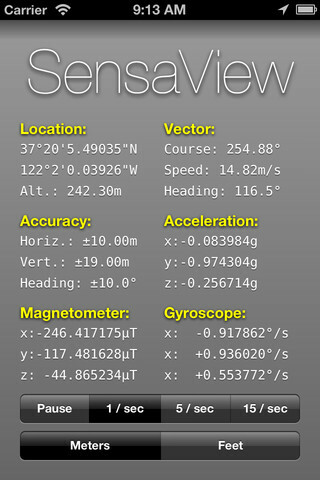 Interesting, I didn’t realize the iPhone had a magnetometer. So, Indiana Jones might be in the market for an iPhone. cool.